One pound makes all the difference – for us to care and you to share…! Great! you’ve reached this page! which says you have a sense of social responsibility! Whilst you happily give to collections and feed the ‘rattling tins’ in the high street, do you wonder is that it? Can I do more? 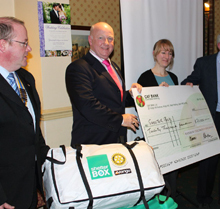 The 2000 Club is a monthly lottery club run by Rotarians to contribute funds for the work we do, so instead of rattling tins every week we thought it would be more proactive if you had a chance of winning, and we have a chance of using the money you give us for charitable purposes, in the local community, nationally and internationally. The chance to win 1 of 2 prizes of £50 for ten months of the year and then three prizes twice a year of £250+, £150 and £50 in June and December. The more numbers we sell the greater the amount of money available for us to distribute as prizes and the sooner we will be able to increase the size of the prizes allocated. You know you’re helping a good cause – not just once, but the whole year! During the past few years, mainly through your help, we have managed to send at least two Shelter Boxes, (see the website: Shelter Box Organisation), to disaster areas throughout the world – occasionally including the UK. Email Us to find out more..